Yesterday was a very long day, especially with the high mileage and all the climbing. While I really enjoyed watching the film last night, in retrospect, I should have bowed out and caught up on my rest. No matter how long I try to sleep, I seem to find myself waking up just after 5am, when the birds start singing their melodies. So, my sleep times are very much dictated by the time I close my eyes. And last night's eye closing didn't happen until shortly before midnight. I didn't have a great dinner last night either. I snacked before we went to see the film, and I snacked a bit before I went to sleep. But, I never had a solid dinner. The burp in my nutrition, coupled with the few hours of sleep, set the stage for a rough day today. But, I hung in there. And I made it through the ride. My Warm Showers host from last night, Wally, had just gotten back from leading a bike tour with Discovery Bicycle Tours. Today he is driving SAG for The Prouty, a popular fundraising bicycle ride in New Hampshire. The ride has six different routes that vary in length from 22 to 200 miles. 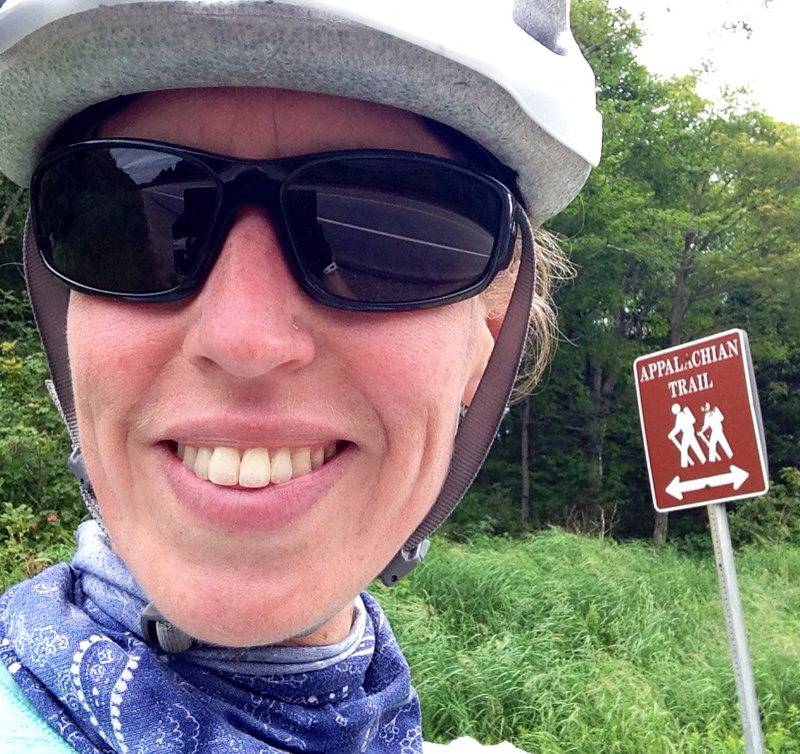 As it turns out, my ride today kept weaving in-and-out of various routes of The Prouty ride. While I love waving to other cyclists, it did get old to acknowledge all of the riders passing in the other direction. There was a point in the ride where I rode along riders doing the 50-mile Prouty route. The riders were about halfway into their ride. Similarly, I was about 25 miles into my ride. I thought it fun that my usual riding pace, even with my loaded bike, allowed me to pass many of the riders. Hey, I'm not competitive. Really, I'm not. Most of today's ride was in New Hampshire. Although I still have some miles to cover in New Hampshire tomorrow morning, I can comfortably say that Vermont still holds first place in the Northeastern Beauty contest. New Hampshire wasn't nearly as manicured, and its men didn't cause any spikes in my hormone levels. Plus, there wasn't even a "Welcome to New Hampshire" sign when I crossed the border! 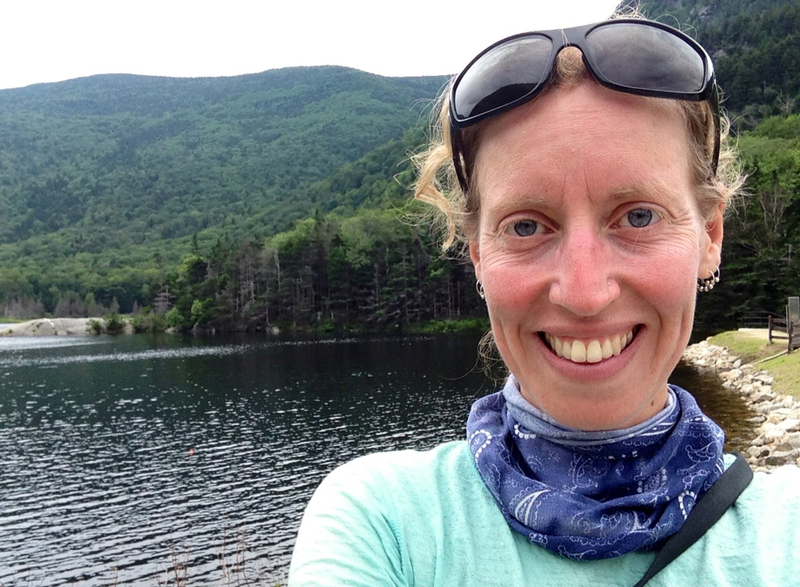 At the top of the Lost River climb, my last climb for the day, I pulled over to enjoy one of the mountain lakes. Taking a rest at a lake atop the Lost River climb. I'm glad I did. Pulled off at the lake was another cyclist, who was resting from his climb up the other side of the mountain. The cyclist was Kevin. Kevin is a 31 year-old brain cancer survivor. 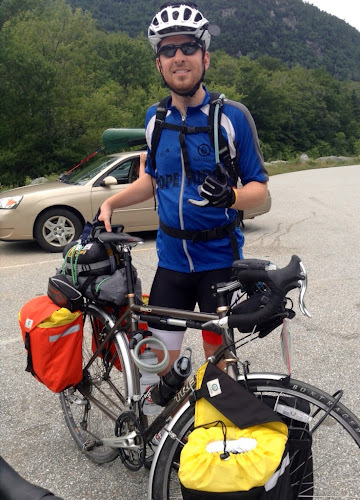 He is riding 1,300 miles (from Maine to Indiana) in 27 days (or as Kevin said, "27-ish days") to raise awareness for cancer patients and to show them that life doesn't end after cancer. Pure awesomeness! He has a great website at www.thehoperide.com. Check it out. In life, we typically look forward to the ups, and we dread the downs. But, when it comes to hills, and especially today's hills, I was very much looking forward to the descent. The final descent delivered me right into Lincoln, my destination for the evening. I had reached out to quite a few Warm Showers hosts along my route through Vermont, New Hampshire, and Maine. Surprisingly, I heard back from very few of them, and most of them were a "sorry, but we can't host." So, tonight is more stealth camping. When I pulled into Lincoln, I scoped out the high school's ball fields. There were a number of "no trespassing" signs posted on the school property. 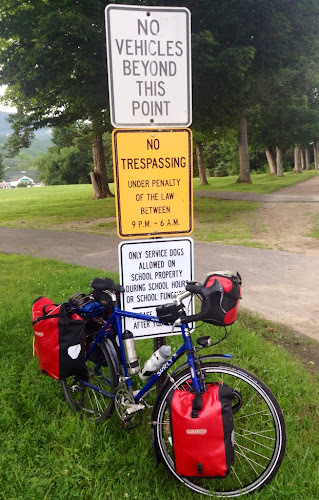 "Under penalty of the law" - great! These had me a little nervous. I did some reconnaissance on Google Maps and found a nearby cemetery that seemed to be pretty well enclosed with trees (yes, cyclists are known to stealth camp in cemeteries as well). So, off I went to scope out the cemetery. I didn't make it all the way to the cemetery, though, as the road leading up to it gave me the creepy jeepies. But, I'm glad I made the trek, because on the way back to down, I noticed a sidewalk along the backside of the high school baseball fields. And...(drum roll please)...there were no trespassing signs! So, I entered the fields from the sidewalk. I headed over to Subway for dinner and to use the wifi. I had to try really hard to refrain from ordering a foot-long and a 6-inch sandwich. Yes, I was really hungry. I ended up ordering just a foot-long sandwich and subsidizing the rest of my hunger with snacks from my food pannier. When it started to get dark, I headed over to the dugouts and set up camp. 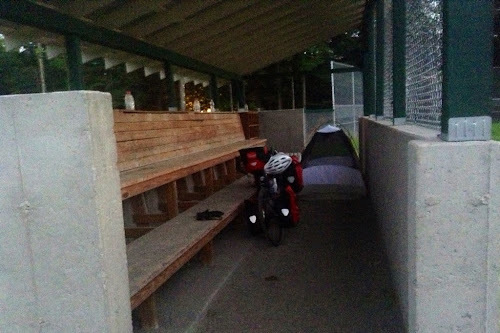 I debated whether to sleep on the bench, with just my sleeping bag. But the biting bugs convinced me to set up the tent. It's almost as if my tent was made for this dugout. I crawled into the tent, rolled over onto my stomach, and fell asleep instantly. I was so tired that I even forgot to brush my teeth. Yes, indeed, it was a tirgry day. But, I realize that it's the down days like these that give perspective to all the wonderful up days. Thanks for the hug, MaryJo! :) Not all days can be stellar. As I mentioned, we need the lows to have perspective for the highs.